Heavy duty trucks are known for their capability to go the extra mile time and time again. Their powerful engines are some of the best in the industry and deliver substantial control and capability compared to competitors. The Chevrolet Silverado 2500HD and 3500HD bring the best performance on the road for the 2018 model year. Two available engines power the incredibly capable trucks: a 6.0-liter Vortec V8 and 6.6-liter Duramax Turbo-Diesel V8. While the former engine comes standard in both trucks, drivers can opt for the diesel engine in both models. The standard 6.0-liter Vortec V8 engine delivers a heart-pounding 360 hp and 380 lb-ft of torque. The available 6.6-liter Duramax Turbo-Diesel V8 engine churns out a heart-stopping 445 hp and 910 lb-ft of torque. While the Silverado 2500HD and 3500HD may boast the same powertrains, their towing capacities are very different. The 2018 Chevrolet Silverado 2500HD can tow up to 14,800 lb when equipped with the6.0-liter Vortec V8 engine. The heavy duty pickup can tow up to 18,100 lb when equipped with the 6.6-liter Duramax Turbo-Diesel V8 engine. 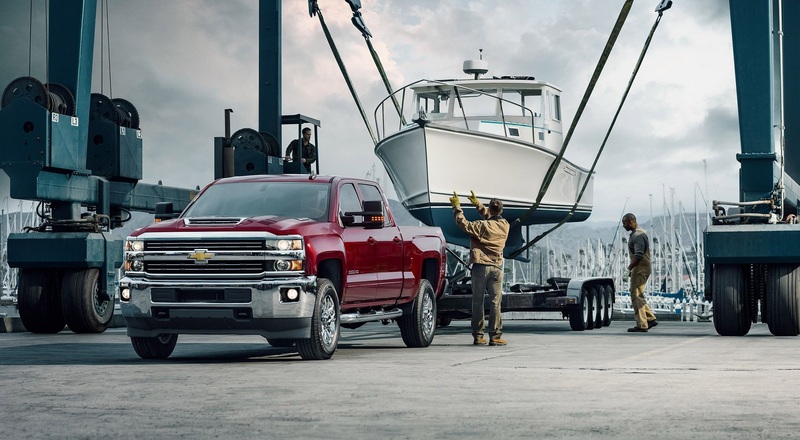 Likewise, the 2018 Chevrolet Silverado 3500HD boasts a maximum towing capacity of 14,600 lb with the gasoline V8 engine. The same truck offers a maximum towing capacity of 23,300 lb when equipped with the turbo-diesel V8 engine.